CHNEP, 2017. Volunteer Oyster Habitat Monitoring Program, Charlotte Harbor National Estuary Program, 38pp. Includes information on volunteering, and Standard Operating Procedures (SOPs), Charlotte Harbor National Estuary Program (1/17). Gillies, C.L., C. Creighton, and I.M. McLeod, Eds., 2015. Shellfish reef habitats: a synopsis to underpin the repair and conservation of Australia’s environmentally, socially and economically important bays and estuaries. Report to the National Environmental Science Programme, Marine Biodiversity Hub. Centre for Tropical Water and Aquatic Ecosystem Research (TropWATER) Publication, James Cook University, Townsville, 68pp. Leonard, D. and S. Macfarlane, 2011. Best management practices for shellfish restoration. Prepared for the ISSC Shellfish Restoration Committee, 42pp. plus appendices. zu Ermgassen, P.S.E., B. Hancock, B. DeAngelis, J. Greene, E. Schuster, M. Spalding, and R. Brumbaugh, 2016b. Setting objectives for oyster habitat restoration using ecosystem services: a manager’s. TNC, Arlington VA. 76pp (see link or PDF). The document Setting Objectives for Oyster Habitat Restoration Using Ecosystem Services, A Manager’s Guide explains the science behind the calculator, and provides examples and case studies and goes hand in hand with the calculator to estimate both bay wide Oyster Filtration and Fish Production (see http://oceanwealth.org/tools/oyster-calculator/) for US estuaries only. Rate of filtration: is density required to achieve full estuary filtration within the residence time. It is calculated by dividing the bay volume by the residence time and converting the output to litres per hour. 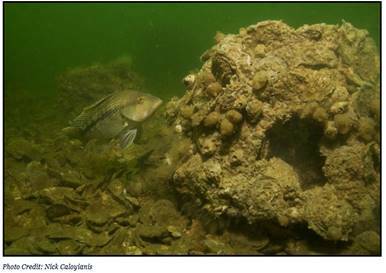 Historic Filtration: A reference value of the filtration that would have been provided by the historic oyster habitat where that historic condition of oysters is known (zu Ermgassen et al. 2013). Historic filtration is not used in calculating current day filtration or restoration goals and is only a historical reference. Current Filtration: The estimate of the current filtration based on the Current Oyster Properties data provided. It is displayed as percent filtration of the Estuary Filter Volume in litres per hour. Goal Filtration: The Estuary Filtration Percent (under Goals) displayed in litres per hour. Fish production data are from zu Ermgassen et al. 2015. (see PDF or link). Estimates are regional estimates of production, and thus do not account for variability that is inherent within individual sites. However, estimates of production can be improved for a particular bay or estuary by using the Est. Site Abundance feature to adjust for relative abundance for your particular bay/estuary. Estimates are only available for the Northern Gulf of Mexico and part of the Atlantic coasts (Floridian, Carolinian and Virginian ecoregions). Est. Site Abundance: Select the estimated site abundance (ind./ha) for the bay or estuary you are calculating for. Default is mean abundance for either the Gulf of Mexico or Atlantic coast (where applicable). High abundance is mean +1 SD. If species is not present, or occurs in low abundance, select ‘None’. # New Individuals: Calculated by multiplying site abundance by acres of restored habitat required to meet filtration goal. New Biomass: The per species biomass, per year. Calculated by multiplying site abundance by acres of restored habitat required to meet filtration goal by biomass for each species per ha. Note: Fish production data are only available for the Northern Gulf of Mexico, Floridian, Carolinian, and Virginian ecoregions. Developed by L. Walters (UCF), R. Brockmeyer & E. Hernandez (St. Johns RWMD), N. Dix (GTM NERR), A.S. Noel, NEFLAP, among others. The goal of this document (revised 3/28/16) was to assess and monitor intertidal oyster reefs using a standardized protocol. The document provides a step-by-step protocol to use on to monitor reefs. Data sheet examples are also provided.